Which Plants Do Well in Containers in Full Sun? Many plant species grow well inside containers situated in full sun. Depending upon the garden’s particular style or theme, selections include palms, cycads, shrubs and small trees as well as flowering perennials and annuals. Choices in container sizes, styles and colors are just as vast. When growing containerized plants, select draining containers that are two to three times larger than the plant’s root ball, allowing room for root growth. Though called a palm, the cardboard palm (Zamia furfuacea) is really a cycad belonging within the Zamiaceae family. Plants are evergreen, with 3- to 4-foot leaves arising from the center rosette. Thick and leatherlike, the foliage has a cardboard feel to it, thus the name. Cardboard palms grow well in the ground in USDA planting zones 9 through 11, suffering damage at 28 degrees F. In areas experiencing frosts and freezes, you should bring containers into a warm location during winter. Plants do well as houseplants. Plant the cardboard palm in a draining container large enough to house the plant and not tip over, as plants can be top heavy and wide. 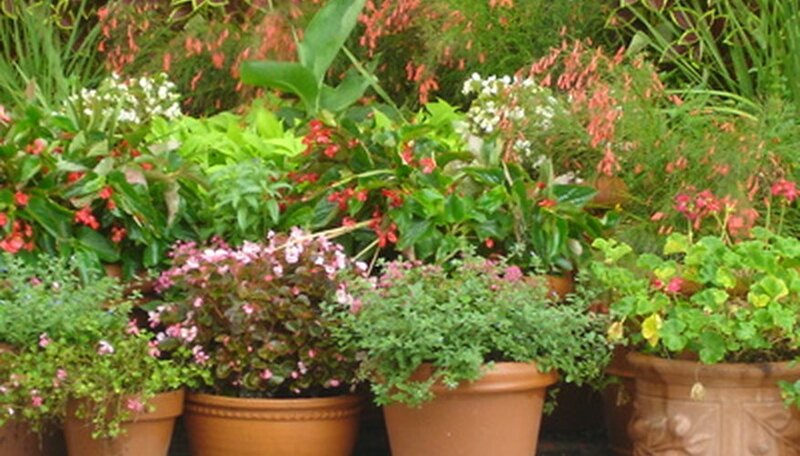 Use a well-draining potting medium, as plants will not tolerate wet conditions. Drought-tolerant once established, cardboard palms perform best with weekly watering. Situate the container in areas receiving full to partial sun. Having a high salt-tolerance, the plants work well in coastal locations. Gardeners desiring a flowering tropical should use firespike (Odontonema strictum) in their containers. The plants are quite attractive with their upright habit and green, glossy foliage and limbs. The foliage has a dense nature, making it a suitable for containerized screens. From early summer until fall, 12-inch spikes of scarlet, tubular flowers fill the plant’s ends. Firespike works well in wildlife gardens, attracting butterflies, hummingbirds and white-tailed deer. Grow firespike in a draining container that is approximately three times larger than the root ball. Use a rich, well-draining soil medium. Established plants are relatively drought-tolerant, but perform best in moist soils. Situate containers in full to partial sun. Firespike grows well year-round planted into the ground in USDA planting zones 8 through 11. In regions experiencing frosts and freezes, you should bring containers into a warm, protected location until warm weather returns. The ponytail palm (Beaucarnea recurvata), sometimes called bottle palm, though resembling a palm, is not a palm at all. It belongs in the same family as the yucca, Agavaceae. This Mexican native reaches up to 30 feet in height in the ground, but container-grown plants average 6 to 8 feet tall. The tree has a wide, spreading base and slender trunk leading up to a clump of long, flowing leaves resembling hair. Use a draining container that is at least three times as large as the ponytail palm’s root ball, filled with a well-draining potting mix. Plants perform best grown in a sunny location. It is very drought-tolerant and containers require watering only when the soil has dried. Ponytail palms grow well planted into the ground in USDA planting zones 9 through 12, suffering foliage damage at 18 degrees F. In cooler regions, you should situate containers in a warm, protected location receiving bright light during the cool months of winter.